Pesto is a great way to add plenty of flavour and healthy fats to a dish. In this recipe, you'll be making your own pesto with Brazil nuts, basil, rocket, hard Italian cheese and plenty of olive oil. You'll see how quick and easy pesto is to make, so if you are looking for more tasty pesto inspiration have a look at the HelloFresh blog this week! Preheat your oven to 200 degrees. Cut the onion in half through the root, peel and chop into small ½cm pieces. 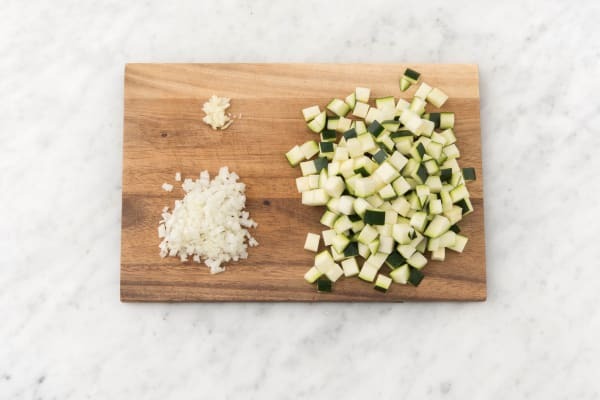 Remove the top and bottom from the courgette, cut in half lengthways, then cut into 1cm wide strips. Chop each strip into 1cm chunks. Peel and grate the garlic (or use a garlic press if you have one). Pop a deep ovenproof saucepan on medium heat and add a drizzle of oil and your onion. Cook for 5 mins until your onion is soft, then add your courgette and cook for another 5 mins. Stir in your garlic and cook for 1 minute, then pour in the arborio rice. Stir your rice into your garlicky oil and cook for 1 minute until the edges are slightly translucent, then add the white wine vinegar. 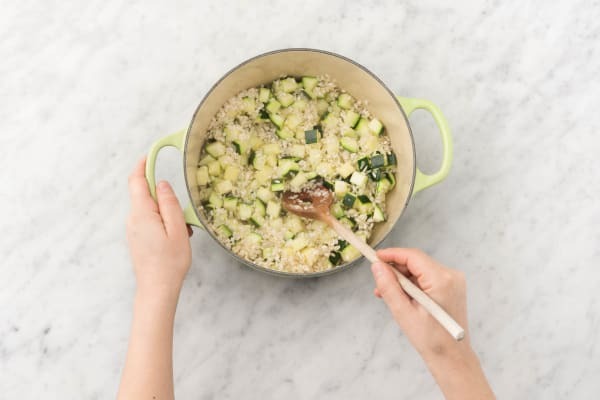 Cook until your vinegar has evaporated, then add the water (amount specified in the ingredient list) along with the vegetable stock pot and a good grind of black pepper. Stir everything together and bring to the boil, making sure your stock pot has dissolved. Pop a lid on (or some tinfoil tightly covering the pan), then put your risotto on the top shelf of your oven to bake for 20 mins. Tip:If your pan isn't ovenproof, just pour the mixture into an ovenproof dish and cover tightly with tinfoil instead. 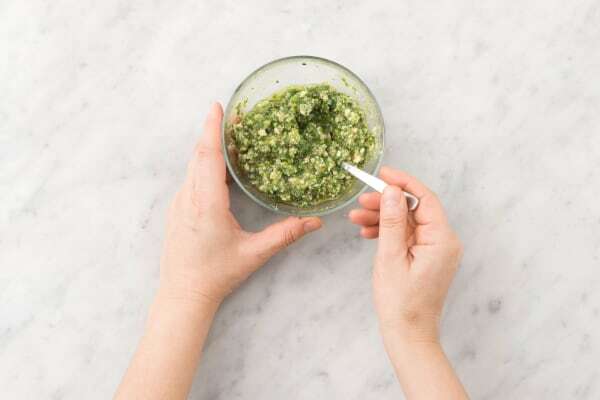 While your risotto bakes, make your pesto. Roughly chop the Brazil nuts and finely chop the basil (stalks and leaves!). Finely chop a quarter of the rocket. Pop your Brazil nuts, basil, chopped rocket and hard Italian cheese into a bowl with the olive oil (amount specified in the ingredient list). Grind in some black pepper and mix it together..
Cut the goat's cheese into 1cm thick slices (you should have four slices per person). Once your risotto is ready, remove it from your oven. Preheat your grill to high. 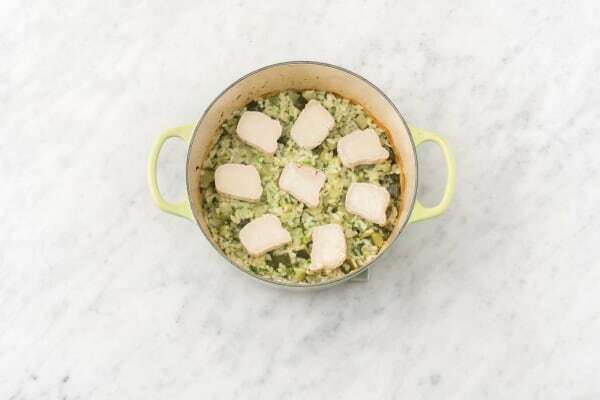 Stir your pesto into your risotto, then flatten it out in the pan. Place your goat's cheese on top of your risotto and then pop it under your grill for 4-5 mins until your goat's cheese has browned. While your risotto is grilling, pop the remaining rocket into a bowl and drizzle in a little olive oil. Add a small squeeze of lemon juice and toss together. Taste and add more lemon juice if you feel it needs it. 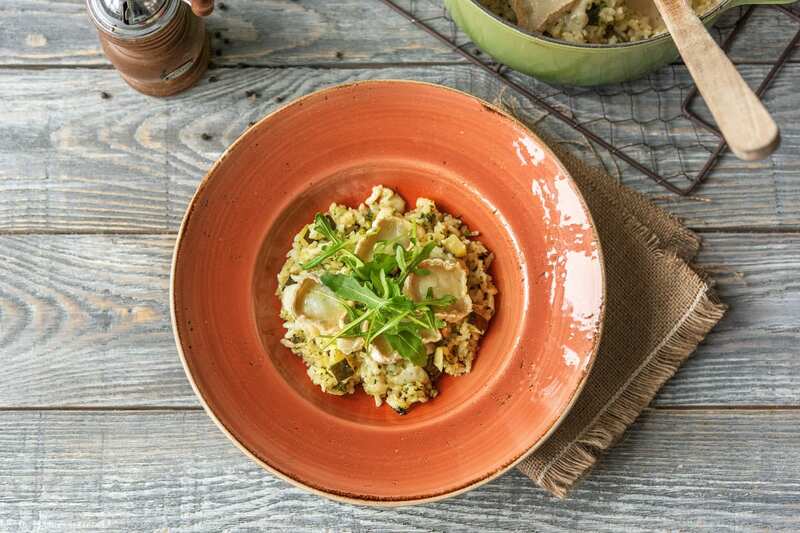 Remove your risotto from your grill and serve in bowls with a handful of rocket on top. Enjoy!